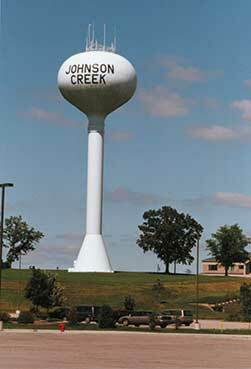 As the Village of Johnson Creek began preparing for significant expansion in the early 1990s it was determined that a new water tower would be needed to accommodate anticipated growth. The original water tower, at 55-feet with a 100,000-gallon capacity was not sufficient to meet then-existing fire flow demand or the requirements of coming growth. Constructed in 1993, the news water tower stands 140 feet high and boasts a 400,000-gallon elevated tank.